1900: I can’t help it. Music makes me cry. More often than we would be led to believe, there are absolutely remarkable films that are released every year with no fanfare, limited budgets and tiny distribution deals. Sometimes we catch them through word of mouth. Sometimes we’ve rented another obscure film and get to see a preview. Sometimes Netflix recommends it and we just like the cover or the treatment. I have been fortunate enough over the years to have “found” several of these films that skyrocketed into my top ten: Pi, Interstate 60, Boondock Saints and now this one. 1900 is the shortened name of Danny Boodmann T.D. Lemon Nineteen Hundred. On an ocean liner, he was found as an infant belowdecks in a lemon crate on the first day of the new millennium. He is loved and collectively raised by the crew, he sees ports all over the world, learns every nook and cranny of the ship. . . and discovers the piano. Over the years, word grown around the world of a virtuoso without rival who lives on this ocean liner, a genius of a man who never once leaves the ship. Decades pass and the ship is set to be demolished, and a former band member has returned to the ship in search of 1900. He knows that his friend would never leave the ship, just as he knows that no other searcher could find him. Put simply, it’s something different. Let’s talk about Tim Roth. In my opinion, he is simply the greatest underutilized actor on the planet. I know it’s a bold statement, but I mean it. Just about every performer has a “hiccup,” or something for which they curse the creation of imdb. To this day I remember the revelation of seeing Rosencrantz & Guildenstern for the first time in twelfth grade. Mr. Orange. He starred with Tupac. He wore an ape costume. He fought the Hulk. During all of this, he brought an astonishing level of talent to roles that could have easily blown up in his face. Tim Roth is simply one of the most watchable actors I’ve ever seen. In the role of 1900, he is at once charming and daring and scared and very much like a little boy. If none of the rest of the movie appeals to you, watch it just for him. He makes us believe that he is a grown man who is at least reluctant to step off of his ship and into the real world, and at most is terrified of it. We can almost feel his glee as he removes the foot brakes from the piano during rough seas, just so that he can roll all over the salon while playing it. He shows us his intense love of music for the sake of music as he cries while Jelly Roll Morton questions his superiority and plays his best to challenge. He also makes us feel the concentration, the pride and the exhilaration of appreciating Morton’s playing and then besting him terribly in a scene that won’t leave you quickly. I watched the scene four times. Pruitt Taylor Vince portrays a trumpet player who befriends 1900, a man who doesn’t make too many friends. Vince is entirely believable as the low-rent, lives only for the music kind of drifter he plays. He makes us understand that he has no choice but to be drawn towards the far greater talent that is 1900. It is he who tries to convince his friend to walk around on shore, to see what else is out there, but who ultimately understands why it won’t happen. He’s the one who comes looking for 1900 when the ship is ready for destruction. He is our narrator and the person through whose eyes we see the story. Mr. Vince was excellently suited to the role and does a fantastic job. The music is. . . sublime. Though there is plenty of period music, mostly jazz and ragtime, it is interspersed with classical and music that 1900 composed (or made up on the spot) and other things that I don’t know how to describe. The film is about music and music flows through it and drives it and holds the entire thing together. The whole thing is music, and the music used in the film is almost another character in the film. I can’t do it justice, really. The last major draw is the setting. The film is beautifully shot. The ship, the ports, the salon, the clothing, the music. . . it’s all magnificent. 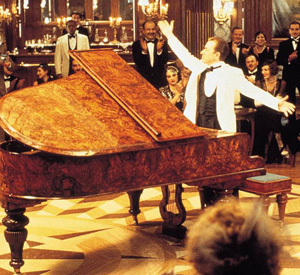 I do appreciate that the single most beautiful thing in the film is 1900’s piano. It’s a period piece, and the man behind the camera obviously had great love for the project. While some DPs are technically brilliant, I don’t think I’ve seen more than a few who convey their love of story and setting as well as it was done in this film. There are so many reasons to see and appreciate this film. I don’t think that my mumbling really helps the cause. I’ll end in saying that I love music and I love film, and this movie so perfectly fused the two that it landed in my top ten after a single viewing. I recommend it highly. Thanks for posting this; my wife and I saw this film years ago on a lark and loved it. One of my favorite scenes is the bit with Jelly Roll Morton and the piano duel, when Morton plays the piece before finishing the cigarette. 1900 goes to play as well… and, I won’t ruin it. It’s one of the more memorable points of the film, and not to be missed. Dead-on right about how visually stunning the movie is as well. Filled with incredible scenes — like when 1900 was playing the piano as it rolled around the ballroom as the great ship rocked during a storm. Superb soundtrack, obviously; worth tracking down the non-US release version as there’s a lot more to it. Wow, this really shows your musical side. I love the fact that you are ope to all kinds of music. Have you heard the new Apocalyptica? Try it you just may like it!